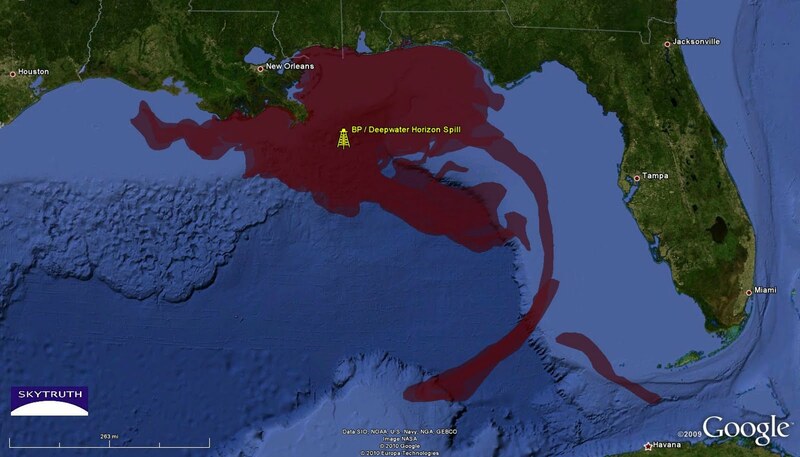 Cumulative BP / Deepwater Horizon oil slick footprint (red). Analysis by SkyTruth. Cumulative BP / Deepwater Horizon oil slick footprint (orange). 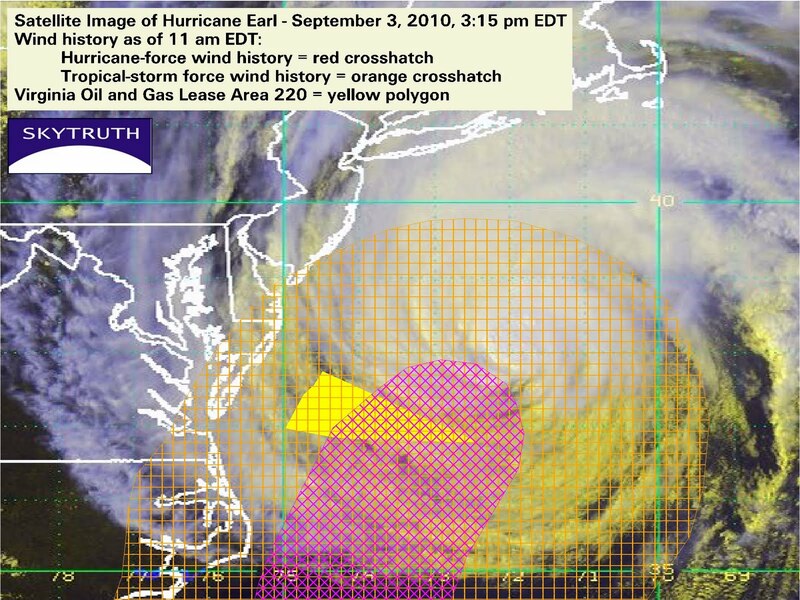 Analysis by NOAA, compiled by SkyTruth. Cumulative BP / Deepwater Horizon oil slick footprint (brown). Analysis by ROFFS. 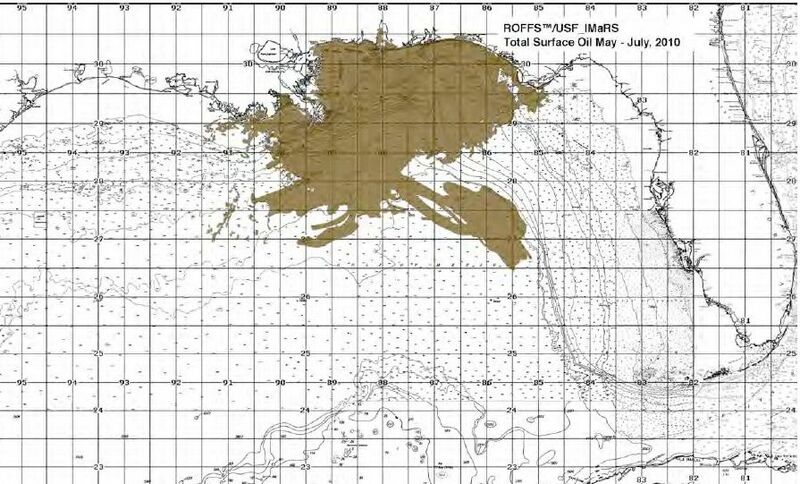 Overall, the NOAA and ROFFS analyses are in general agreement. The total NOAA oil-slick footprint covers 46,299 square miles (119,915 km2). 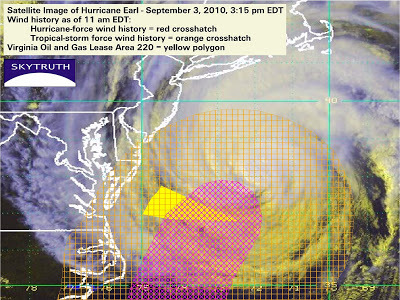 SkyTruth’s analysis is similar except for our inclusion of possible oil sheen entrained in the Loop Current and entering Florida Straits late in May, before a large clockwise eddy (Eddy Franklin) got organized and effectively kept the slick bottled up the the northern Gulf for the remainder of the summer. 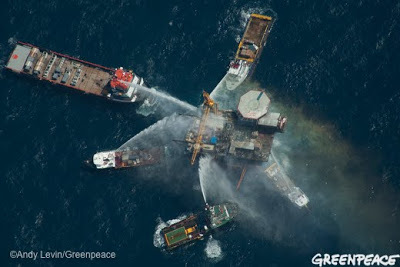 The total oil-slick footprint in our analysis is 68,000 square miles (176,119 km2). 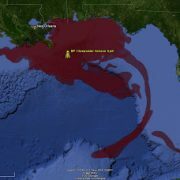 Finally — after killing 11 people, injuring 17 others, spewing 172 million gallons of oil and untold amounts of natural gas into the ocean, and tormenting the entire Gulf of Mexico region for almost 5 months — the BP / Deepwater Horizon dragon has been declared officially dead by the US Coast Guard. After some tense last-minute complications, a relief well successfully intersected the failed Macondo well 13,000′ beneath the seafloor last Thursday (September 16). Cement was pumped into the base of the Macondo well, and pressure testing conducted over the weekend confirmed that this cement job had sealed the well. Hallelujah. It’s a relief, but the BP / Deepwater Horizon Oil and Gas Disaster is far from over. There is a lot of work to do to fully measure and understand the impact of this event, to monitor its impacts over time, to apply all the lessons learned to our offshore drilling practices, and to help the Gulf ecosystem and communities recover. Fire consumes neighborhood in San Bruno, California, following rupture of a natural-gas pipeline. Photo by Paul Sakuma / Associated Press, courtesy Los Angeles Times. 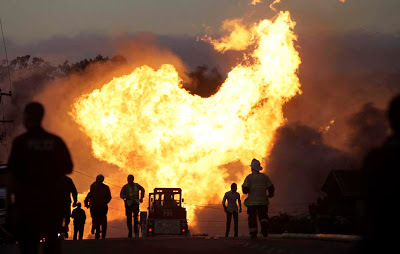 Tragic news coming out of California as the death toll has now reached 7, with 6 people still missing, from the massive pipeline explosion and fire that consumed 37 homes in San Bruno, just south of San Francisco (map and photo gallery from Los Angeles Times). 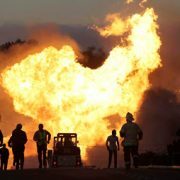 The 30″ diameter high-pressure natural-gas pipeline, installed in 1956, ruptured shortly after 6pm local time on Thursday, September 9. The explosion was so strong that USGS seismometers recorded it as a Magnitude-1.1 earthquake. 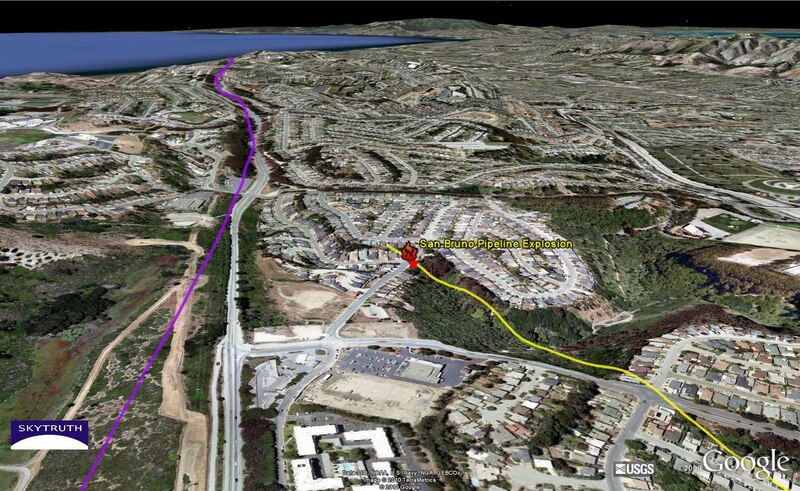 Map showing location of San Bruno explosion and fire. San Andreas Fault shown in purple. 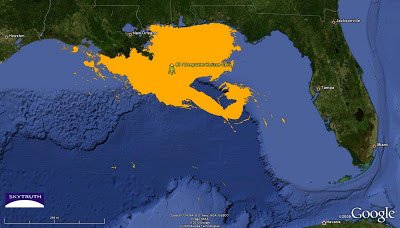 Speculative minor fault or fracture zone, interpreted by SkyTruth from Google Earth imagery, shown in yellow. What caused this pipeline to rupture? Nobody knows yet, but this is of course a very seismically active region with notoriously unstable geology. The pipeline failure happened at the intersection of Earl Avenue and Glenview Drive, at the head of a steep ravine. Our analysis of the imagery in Google Earth (high-resolution aerial survey photography) suggests this ravine may follow the trend of a fracture zone in the bedrock that is roughly parallel to the San Andreas Fault, which lies just 1,000′ to the west of the blast site. It is possible that stress was steadily and incrementally building on the rigid pipeline as strain accumulated across this minor fault or fracture zone, or as soil gradually slid down into the ravine. Consider this analysis to be preliminary and highly speculative. UPDATE 9/13/10 @ 11am – Check out the Pipeline Safety Trust’s web page for this disaster, and for more information on causes of pipeline failure, other incidents, and pipeline regulation and oversight. Fighting fire on the Mariner Energy platform in Vermilion Block 380, Gulf of Mexico, September 2, 2010. 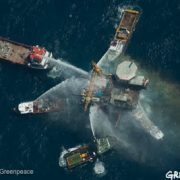 Photo by Greenpeace. More photos here. Here at SkyTruth we finally got NASA/MODIS satellite imagery taken yesterday of the Gulf of Mexico, covering both the BP/Deepwater Horizon/Macondo well site and the location of the Mariner Energy platform that caught on fire yesterday morning while workers were painting it. Everyone was rescued and the fire was extinguished later that day. Early reports of a growing sheen of oil in the water were later retracted by the Coast Guard, and the seven wells under that platform have reportedly been shut in and are not leaking. 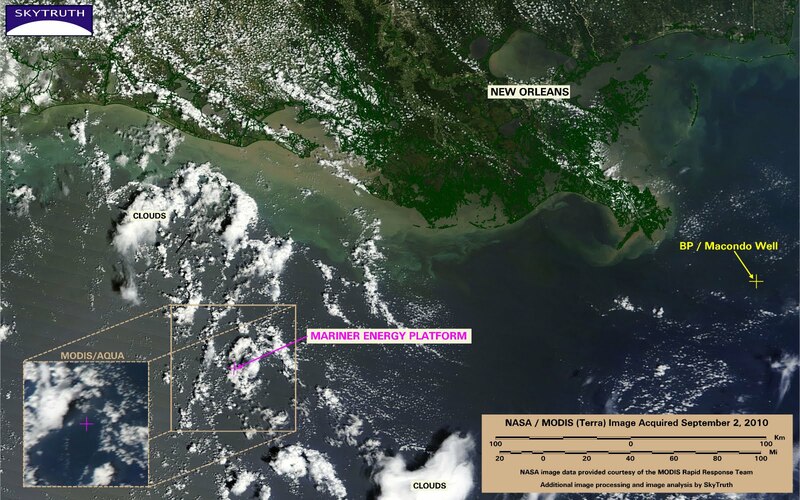 MODIS/Terra satellite image showing Mariner Energy platform (magenta cross) relative to BP spill site (yellow cross). Inset shows MODIS/Aqua imagery of the platform location taken an hour or so later. NASA reported that the MODIS / Terra image taken at about 1pm local time showed a small plume of smoke from the burning rig, but the alleged plume is located about 40 miles northwest of the stated platform location, which we have verified by overlaying government GIS data for the locations of all oil and gas platforms in the Gulf. An offshore weather station on a Shell oil platform in the general vicinity reported wind consistently from the east to east-southeast. 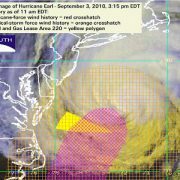 So we’re not sure what that reddish-brown blotch is that caught NASA’s eye – possibly a large patch of Sargassum, although it does seem to throw a shadow like the adjacent clouds, so maybe 1) it is a different smoke plume, or 2) everyone has misidentified the Mariner platform, which is very unlikely. Another little Gulf mystery. BOTTOM LINE: We don’t see anything on the Terra image to indicate either smoke or oil slick around the Mariner platform location, but it is pretty cloudy. The Aqua image taken at about 2pm local time (inset) is clearer, but we don’t see anything unusual on it either. We’ll keep looking at the area for the next few days but this seems to be just another one of the 100+ “run-of-the-mill” fires and explosions that are reported on Gulf oil and gas platforms every year.